Kellie Glass began writing in 2007 for a corporate wellness program. She co-authored "How To Eat Fried Chicken and Be Thin Too," released in 2009. Glass is a registered dietitian and graduated from the University of Kentucky with a Bachelor of Science in dietetics. Stomach conditions such as gastritis can make mealtime challenging and unpleasant. Trying to determine which foods to avoid can seem like a daunting task. While no specific diet for gastritis exists, following a few simple rules can help with meal planning and help to control your symptoms. Your body must break down the food you eat into a form that is usable by your cells. Digestion begins as soon as the saliva in your mouth comes into contact with the food you eat and continues until absorption occurs in your small intestine. Your stomach produces hydrochloric acid and an enzyme to digest protein during normal digestion. Your stomach has three main functions during the digestive process. It stores the food and liquid you swallow; it mixes the food, liquid and digestive juices together; and it slowly empties digested food into your small intestine. Your stomach lining can normally handle these powerful digestive juices as a result of the mucus layer secreted during digestion to protect your stomach lining. When you have gastritis, your stomach lining has become compromised. Gastritis refers to the inflammation of your stomach lining. In normal digestion, the juices secreted by your stomach break down the food you eat. When you have gastritis, your stomach produces less acid, enzymes and protective mucus leading to nausea, vomiting and upper abdominal pain. Other symptoms include indigestion, heartburn, hiccups and loss of appetite. Some people with gastritis have no symptoms. Others can have the more serious erosive gastritis where the stomach lining erodes, leading to bloody vomit and black tarry or bloody stools. Non-erosive gastritis is most often caused by the bacteria H. Pylori, which attacks the stomach lining. Other causes include chronic vomiting, drinking coffee or other acidic beverages, increased stomach acid from stress and cigarette smoking. Erosive gastritis can be caused by long-term use of non-steroidal anti-inflammatory drugs such as ibuprofen or naproxen, alcohol and cocaine use, as well as radiation treatments. If left untreated, chronic gastritis can lead to peptic ulcer disease, gastric polyps and stomach cancer. Making some dietary changes can help ease gastritis symptoms. Eating heavy high-fat meals will prolong your digestion time and aggrevate gastritis symptoms. Your evening meal should consist of lower fat choices and you should avoid over-eating. The University of Maryland Medical Center recommends making the following diet-related changes: Identify and eliminate food allergies. Drink six to eight glasses of water every day. Decrease your intake of red meat in favor of lean meats such as chicken, turkey and fish. Avoid beverages that can irritate your stomach lining or those that increase stomach acid such as coffee, alcohol and those that are carbonated. Include apples, celery, cranberries, onions, garlic and tea, which contain flavenoids that may inhibit the growth of H. Pylori. 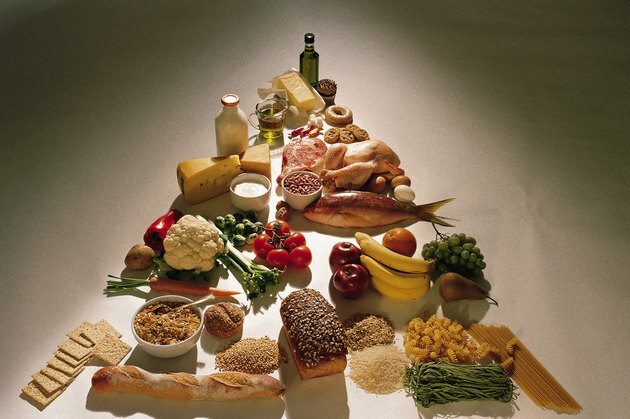 Avoid refined foods and foods containing trans-fats.